Cut calories dieting with the benefits of brushing your teeth unleashed. Spending time between meals can be overwhelming.< br />Toothpaste to suppress your appetite. The benefits of brushing your teeth are endless. 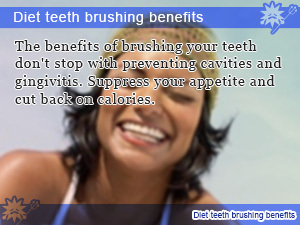 Did you know that just that there is a way to brush your teeth that actual can help you cut calories in your diet? It's hard to believe, but it works just like candy to keep snacking urges from taking over your body taking in tons of calories putting on the pounds. How does brushing my teeth help me lose weight? Brushing your teeth after a meal is almost second nature. The feeling of food that gets left behind after a meal being ripped away from the space between your teeth reaching your tongue causing you to remember what you ate last can be unsettling to say the least. So you brush your teeth. After brushing your stomach growls and surely this is a signal that maybe it's time to take out a snack to satisfy your most primal urge to eat. Oh, wait! You just brushed. It's okay as long as you brush again, right? These are some of the thought that cross your mind everyday between meals especially for diet conscious people looking to lose weight cutting calories. In this walk in Slism, we will discuss the benefits of brushing your teeth while dieting and how you can use simple innocent teeth brushing as a tool to cut calories to make more informed decision throughout your day cutting back on snacking leading to diet success and weight loss that can go the distance. When ask about the benefits of brushing your teeth, what first comes to mind is to fight cavities. In fact the main purpose of brushing your teeth it to scrape leftovers off your teeth preventing cavities from forming in your teeth. It turns out that there is more to brushing your teeth than fighting cavities. Brushing your teeth leaves your mouth looking clean. That's why most people would feel reluctant about eating something right after brushing thinking out loud I just brushed my teeth...Unlike calories that you can always burn off doing exercise working out, but all snacking does is increase your calorie intake making your fat. Typically, it is a good thing to brush your teeth after meals to make getting cavities more difficult. There are people that think that the time between brushing your teeth and their next meal is too long and this tends to lead to cravings with the resolve of teeth brushing again. On the other hand, brushing your teeth leaves the taste of toothpaste in your mouth that is effective in inhibiting the urge to snack between meals. Although especially the stomach is not necessarily empty, the desire is filled enough only with brushing teeth, and, probably, the person that I am craving something to eat somehow ceases to eat between meals. When choosing the toothpaste that is right for you, there are a wide array of choices to choose from including flavor preference and dental hygiene benefits such as fighting plaque buildup. Before diving in too for choosing the tube of toothpaste that feels right you need to consider what your objective to brushing your teeth is first. If you are using toothpaste when brushing your teeth, do you expect to use any effects? In fact, you do not really effect change without using toothpaste also use if only purpose of dropping a plaque attached to the tooth. As an effect of the toothpaste such as teeth whitening, prevention of bad breath, prevent gingivitis mainly, such as prevention of periodontal disease can be given various effects have been touted by product. A good idea when you buy toothpaste is to also try to buy from than whether there is any effect other than the taste. To say the least the diet entailed in this column is more about making your teeth whiter. 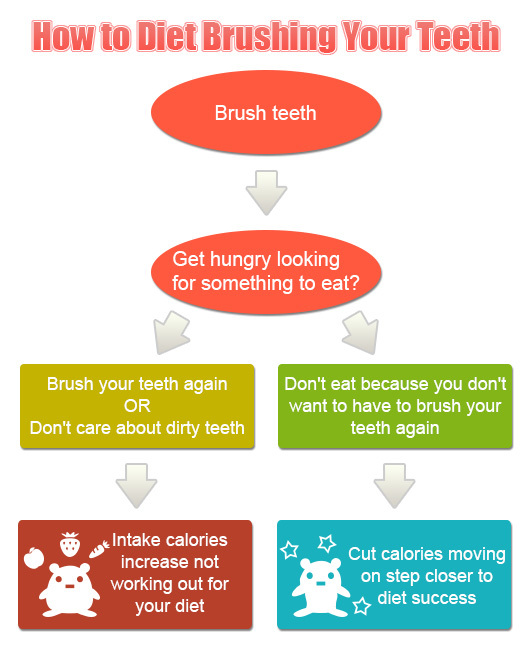 To the last, probably, you may think that there is almost no diet effect, although there may be the prevention-of-tooth-decay effect to the person of eating without the ability to bear, since this diet is restriction of the between-meal snack by thinking that you can prevent overeating by simply brushing your teeth. Since a feeling can be beguiled now with the person I am craving something to eat by brushing teeth, it becomes unnecessary to eat between meals, and it leads to reduction of an ingestion calorie as a result. It may prevent you from eating from the thought that the person of the tidiness does not want to dirty in the mouth either. Let's think about your practice and whether it applies to both types of the info-graphic above. Worried about your next cancer checkup? Learn how chewing your food not only helps your diet, but also can help you prevent cancer causing substances from entering your body! Having a healthy snack makes a difference when it comes to dealing with a growling stomach while escaping the guilt of eating between meals. Tips for snacking healthy. Here are 5 drinks for dieting that you are going to need in weight loss. When drinking water doesn’t cut it, there are other options. Here is what you need to be drinking. Shredded seaweed such as Japanese Gagome Kombu unlocks amazing health benefits in your diet not to mention helps prevent overeating and may remedy constipation. Its official the Oden diet is awesome! Low calorie Japanese stew to put all other hot pots to shame. Eat less while still coming out of your meal fully satisfied. The benefits of brushing your teeth don't stop with preventing cavities and gingivitis. Suppress your appetite and cut back on calories. 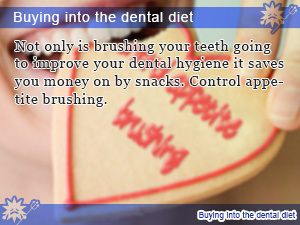 Not only is brushing your teeth going to improve your dental hygiene it saves you money on by snacks. Control appetite brushing. 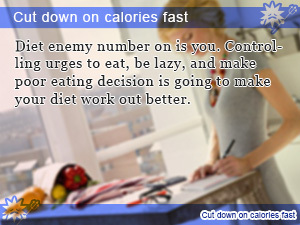 Diet enemy number on is you. Controlling urges to eat, be lazy, and make poor eating decision is going to make your diet work out better. Copyright (c) Slism All Rights Reserved.